"Use shredded cloth with sink"
This puzzle is nearly identical to a puzzle in Zak McKracken and the Alien Mindbenders. In Zak, you used toilet paper in the sink, then turned it on to make it overflow. 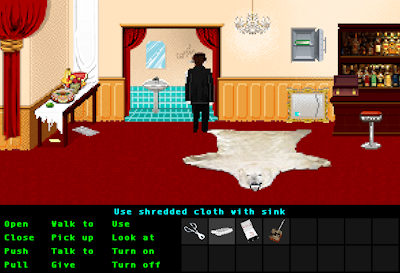 In Host Master, you use a piece of shredded cloth to make the sink overflow.